Just to add rhubarb in the list of things that grow in London gardens, and provide insight into the variety of tastes that can be created in jams with this vegetable sometimes considered as fruit. 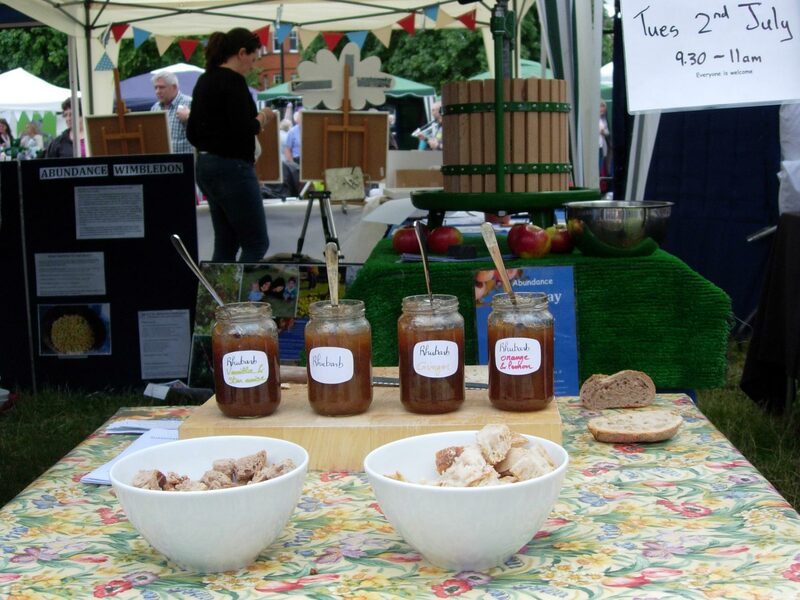 Four varieties of rhubarb jam were offered for tasting at the 2013 Wimbledon Green Day on Wimbledon Common. Image Abundance Wimbledon. The Mayor of Merton tasted my rhubarb jam, and this must be somewhere in the image archives of the Wimbledon Guardian journalist who took pictures at this very moment. Abundance Wimbledon had a stall on the 2013 Green Day fair and we decided that doing a jam tasting was a good idea. It would once more show what can be done with produce from local gardens. I had made the suggestion during an Abundance Committee meeting. “Could we have some rhubarb? I would make several batches, let’s say four, so that people could try different tastes”. This is approximately what I said. A Sustainable Merton representative supplied the rhubarb and I quickly made the jams, organised and ran the tasting. We had four variants: plain rhubarb, rhubarb and ginger, rhubarb, orange and lemon and rhubarb, vanilla and star anise. No clear winner, as people have different tastes, and the jams had different textures too, yet a slight preference for the vanilla and star anise. It was the most uncommon. Do the same, experiment, or for a safe choice have a look at the so many recipes you can find on the Internet. After looking at four or five of the rhubarb and ginger jam recipes you will probably have figured out what is the most common way of making it. An other piece of advice: it is quite nice to feel the rhubarb morsels in your mouth. To achieve this, two things: avoid peeling the rhubarb stems when you cut them into pieces, and apply the cooking method described in this blog’s article called “candied plum jam”. Rhubarb: a fruit? Rhubarb is a vegetable, yet I have just read that “a New York court decided in 1947 that since it was used in the United States as a fruit, it counted as a fruit for the purposes of regulations and duties. A side effect was a reduction on imported rhubarb tariffs, as tariffs were higher for vegetables than fruits.” Source: http://en.wikipedia.org/wiki/Rhubarb, accessed 11 May 2014. This entry was posted in Eat, Events and tagged Rhubarb, UK, Wimbledon by Les Jardins d'ici. Bookmark the permalink.